period having been conducted in the schoolhouse one mile north of the present church building. Among the organizing members may be mentioned George Storck, F. Dallman, L. Vaudt, C. Radke, Mrs. John Westphal, Carl Marquardt, R. Kneuper, John Lienemann, H. E. Marquardt, Charles Wishmyer, August Ziemann, B. P. Lienemann, F. Marquardt and William Bernau. Rev. E. A. Brauer is the present minister. In 1870 a number of Lutherans from Clayton County, Iowa, settled in the northern part of Madison County. 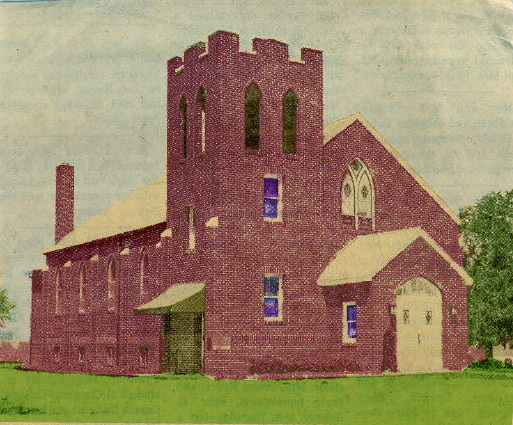 Pastor Mertens, a pioneer missionary of our state, met with them and held the first Lutheran service in this area in Booneville on February 5, 1872. He continued to come as often as possible during the next few years. At first he met with the small group in private homes, generally in the home of Mr. and Mrs. Gerhard Storck. Later, the group met regularly in the Storck schoolhouse in Jefferson Township. In 1875 the Rev. J. Horn was installed as pastor of the Lutheran congregation in Dexter. He also served the preaching station in Jefferson Township. On May 14, 1885, Trinity Evangelical Lutheran Church, Jefferson Township, was organized. In its constitution the congregation acknowledged all the books of Scripture as the inspired Word of God and subscribed to the confessional writings of the Lutheran Church as contained in the Book of Concord. The newly organized congregation dedicated its first church, a 28x42x16 frame building with a 65-foot steeple equipped with a 700-pound bell, on November 29, 1885, on a four-acre plot donated by Mr. and Mrs. Gerhard Storck, four miles south of Van Meter in Jefferson Township. In 1889 the congregation became a member of the Evangelical Lutheran Synod of Missouri, Ohio and Other States, now known as The Lutheran Church Missouri Synod. The congregation was served by pastors of Zion Lutheran Church, Dexter, until 1904 when the Rev. C. Jobst became the first pastor of Trinity Congregation. A parsonage was built to provide a home for the new pastor. On February 20, 1928, this building was destroyed by fire. A new parsonage was built immediately and was dedicated in September of the same year. Less than a month later, on Sunday, September 30, the church also was destroyed by fire. These two fires in one year were a severe blow to the congregation. However, plans for the building of another church were made immediately. The construction of a tile-veneer church, 30x68, with full basement was begun before the end of the year, and with God’s blessing it was possible to dedicate the new church on the second Sunday after Easter in 1929. Because of faulty construction, this structure was rebuilt almost in its entirety with the work beginning in 1950. A new church, veneered with red brick with over-all dimensions of 30x94, was dedicated on February 4, 1951. An addition to this building, including a spacious entryway on the main floor, was dedicated in September 1975. This page was created on Sept 23, 2006. This page was last updated Thursday, 19-Jan-2017 18:06:48 EST .